Steeped in history, the building once housed the local blacksmith and in the 18th Century became a popular Coaching Inn. It remains Armscote’s only pub and, saved and sensitively refurbished in 2013 by the family behind Baylis & Harding, it retains many distinctive character features, including exposed beams, flagstone floors and magnificent fireplaces. Clever, contemporary touches now lend this remarkable building a luxurious yet comfortable atmosphere, which can’t fail to charm. Outside, further delights await. 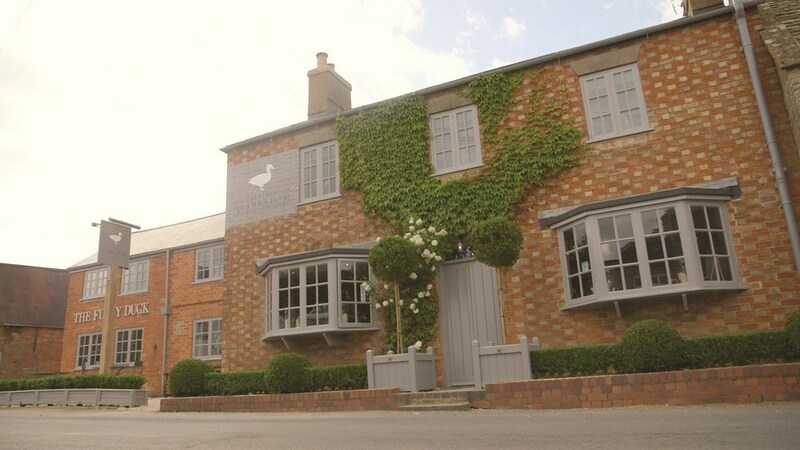 We welcome children and four-legged friends and our pub garden is ideal for families to enjoy leisurely lunches, drinks or snacks whilst the beautifully landscaped courtyard garden offers a sophisticated area to drink or dine. Whether you’re on a flying visit, or nesting down for a more lengthy vacation, we want you to have the most restful and enjoyable stay. Here at The Duck, we do not stand on ceremony and whether you are sporting battered walking boots or a ballgown, you are welcome to enjoy any part of our menu anywhere. We also pride ourselves on thinking of everything so you don’t have to. Want to walk in the rain? Take advantage of our Hunter welly loan service – we’ve a pair in your size. Forgotten your hair straighteners? Ask for our DIY beauty box, which is fully kitted with everything you could possibly need to feel gorgeous.